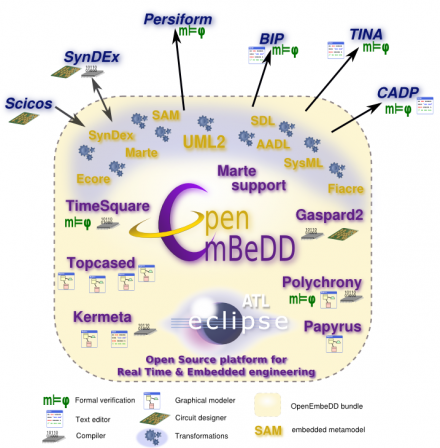 OpenEmbeDD is an Eclipse-based "Model Driven Engineering" platform dedicated to Embedded and Real-Time systems (E/RT). Its aim is to offer engineers who design and develop E/RT software the means to express, simulate, validate and test the targeted system before any component has been solded on a circuit board. The OpenEmbeDD project intends to produce, collect and package open source MDE software for Real Time & Embedded (RT&E) systems. As RT&E MDE design is first model driven engineering, the OpenEmbeDD platform is based on MDE generic tools which RT&E processes are built upon. MDE: Model Driven Engineering The use of models in software design appears as a enhancement of the Object Oriented Programming solution to the software crisis induced by increase of code complexity. Then the UML language gave designers a standard to write specifications. Because a specification officialy represents what the corresponding software piece must be, the idea occurs engineers should work on this model as deeply as possible in the software process, against pinning UML on the wall and coding without a look on it. The Model Driven Engineering now transforms models, adds behavior to them, simulates them, validates them with formal methods, extracts tests from them, generates code for multiple targets. The OpenEmbeDD project intends to produce, collect and package open source MDE software for Real Time & Embedded (RT&E) systems. As RT&E MDE design is first model driven engineering, the OpenEmbeDD platform is based on MDE generic tools which RT&E processes are built upon.